Turn Your Idea Into a Tattoo! 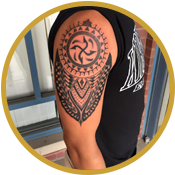 The talented pros at Iowa City Tattoo create masterful works of art on your skin. Visit us today and we'll sit down to discuss with you what type of design you want. Stop by our studio for your next tattoo. Voted the Best Tattoo Shop for three, consecutive years, Iowa City Tattoo is considered the premier spot for exceptional tattoo designs. Our artists have the unique skills and years of experience to create simple and intricate tattoos. Many of them started inking tattoos right out of high school, while two of them attended college, where they received their Bachelor of Fine Arts degrees. They love what they do, and enjoy meeting and talking with different people, getting to know a little about them and creating tattoos that reflect their personalities. Iowa City Tattoo has been in the area for more than 15 years. We have even inked the grown children of some of our past clients, since we have served the same area for so long and have developed such a great reputation. In fact, Iowa City Press Citizen listed us as the Best Tattoo Shop in June of 2012, 2013, and 2014. Monday, 12:00 p.m. - 6:00 p.m.
Tuesday & Wednesday, 11:00 a.m. - 6:00 p.m.
Thursday - Saturday, 11:00 a.m. - 9:00 p.m.
Sunday, 2:00 p.m. - 8:00 p.m.
We are located directly across the street from Robert A. Lee Community Recreation Center.